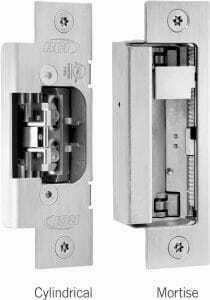 Rutherford Controls 5 Series No-Cut Cylindrical and Mortise Electronic Strike designed to fit ANSI-prepped frames featuring new micro-motor technology. A perfect product for commercial facilities, industrial buildings, retail outlets and more. 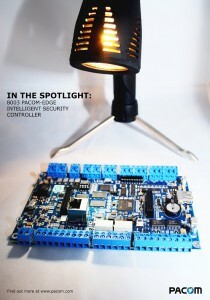 8003 Pacom-Edge Intelligent Security Controller designed for alarm and access applications. This device can stand-alone or as part of an integrated access and alarm system for multisite applications. Axis’ Zipstream Technology, which is a video compression method for surveillance. This technology produces a lower average bitrate without losing frame rate, image usability or resolution. It also extends memory card storage and operates optimally in low light. The best new product award went to Safran Morpho for MorphoWAVE. Some additional winners included product submissions from Spectra Logic, DDN Storage, HauteSpot Networks Corporation, NICE Systems, Samsung TEchwin, FST Biometrics, Dotworkz Systems, EIZO, EverFocus Electronics Corp, Novattach, Inc., NETGEAR, Phybridge and Honeywell Security Products Americas. One of the best aspects about attending the education sessions for security project managers and integrators is the availability of the Certified Security Project Manager (CPSM) credential. Onsite computer-based testing was held on April 15 for those candidates seeking this certification. This interactive session was open to all attendees, focusing on assisting companies uncover what works within their security protocols and how to integrate social media within their processes. The session also addresses recruiting, hiring and retention for security manufacturers, alarm companies, consultants and end users. This session addressed how big data can be used to create actionable strategies, determine methods that utilize thinking in different scenarios, and identifying specific sources of information that can assist your security operations. This last integrative session address development and design for emergency operations centers, addressing the conditions needed and how software, automation and video work together in deployment. The session helped participants gain insight on leveraging cloud technology while learning how to forge relationships with service providers. Other highlights include the IT Security ONE2ONE summit for IT security executives. This summit was an exclusive 2-day symposium limited to 40 key IT security leaders discussing the convergence of IT and Physical Security. Guest speakers at this event were David Cass, CISO, Reed Elsevier; and William Worthington, CISO, Caesars. In addition to the workshops and exhibits, there was always something to do. Special events for the conference included the 12th Annual AIREF Golf Classic at the Revere Country Club; The SAMMY Awards, held at Marco Polo 701; the 2015 Women of the Year Award Reception, held at Delmonico Steakhouse inside the Venetian; ISC West Kick Off Party at OMNIA Nightclub at Caesar’s Palace; Leave ISC West with CPSM Behind Your Name; SIA New Product Showcase Awards Announcement; Security Dealer & Integrator Magazine’s 2015 Fast50-America’s Fastest Growing Systems Integrators; the SIA InteropFest & Cocktail Reception; the Security 5K Run/2K Walk; Pass Launch Event; Learn from LAW ENFORCEMENT how verified alarms lead to priority response; and the Official ISC West Customer Appreciation Party. The dates have already been set for the 2016 event, which will take place at the Sands Expo in Las Vegas, NV April 6-8, 2015, with the SIA Education at ISC taking place April 5-7, 2016. For more information on the ISC West Conference, and information on how we can assist with your commercial security needs, contact the team at Great Valley Lockshop today!